In January 2018, an Eighth – grade class at DeWitt Middle School worked hard over just a few weeks to explore and express themselves and common themes in their lives with Musicians for World Harmony. As the project unfolded, they also started to sing, and the chorus for their piece is their chosen theme: “We all Belong Here”. In all 22 students worked in class with performing artists Samite and Nate Richardson, and their teachers Theresa Souchet and Aaron Arm. Almost all Middle school aged youth face a lot of pressures, and expression in the face of those challenges can be difficult. On top of that, “At least half of the students in the class were not born in our country”, Theresa explained. This ELA class that combines children of immigrants, some who came as refugees, and others whose families are from Ithaca. All of them are in the midst of adolescence; some speak English fluently, others not as much, and two boys – new to Ithaca from Puerto Rico – speak almost entirely Spanish but worked hard on their project with the help of the teachers. The students were given broad themes to choose from to express what felt relevant to them; their works include their thoughts on Peace, Not Giving Up, Family, Hope, Comfort, Friendship, and Fun. They worked in pairs and created a few lines each – some verses were playful. Others express calls to action, and others express appreciation to family members. At the end of the project, 18 students took a field trip to Electric Wilburland Studio in Newfield to record their individual spoken-word statements and to sing as a group. At first, in the classroom, the singing started with a few of the boys who felt more confident with their voices; the rest were pretty quiet in a group. At the end of the recording session, all the kids there were singing loudly together, many also dancing, their laughter punctuating the verses. At the end of the project, more than a few expressed gratitude for the opportunity to work with Nate and Samite and to check out the studio. A few noted they knew a little more about themselves or a classmate. For some, the foray into self-expression took courage and they were proud to have found their voices. We hope you enjoy the video and sound recording! MWH is grateful to DeWitt Middle School, IPEI, and the Legacy Foundation for their resources to make the project a reality. The program was also made possible in part with funds from the Decentralization Program, a regrant program of the NY State Council on the Arts with the support of Governor Cuomo and the NY State Legislature, and administered by the Community Arts Partnership of Tompkins County. February 2017: While the nation waits and debates the fate of immigrants and refugees who want to come to the United States, Musicians for World Harmony uses music to encourage young refugees who are already here to express themselves creatively and share their wishes for peace and the future. We recently completed a project with the North Side Learning Center, which houses an array of programs and services that help the refugee and immigrant community in Syracuse. Through Music Heals, musicians involved with MWH use music and music therapy principles to “help people find their voices”. 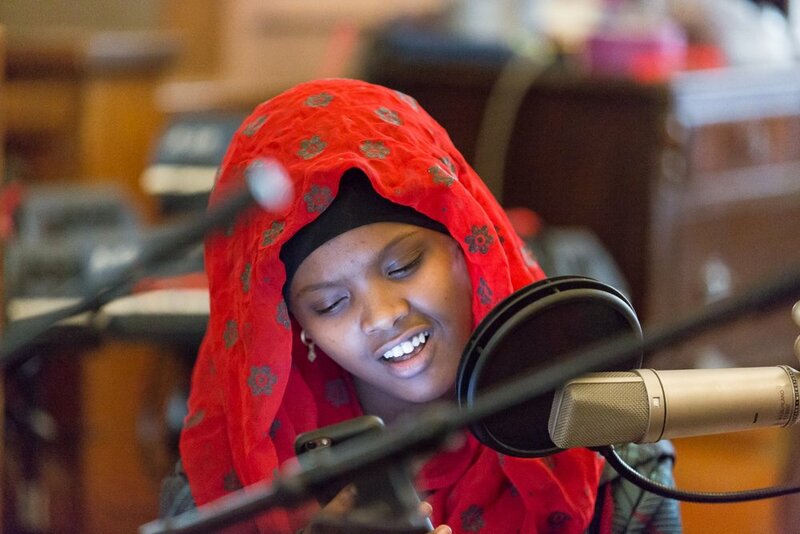 In this project, about 12 high school aged girls, all Muslim and all from Somalia, experimented with poetry, singing, rap, and instruments over a series of several evenings at the Center on Syracuse’s North Side. Samite Mulondo, world musician and a former refugee himself, led the project with the young women. It culminated in a recording session at Electric Wilburland Studio in Newfield, NY, where four of the participants experienced performing and having their poetry and words recorded with music played by Samite and Nate Silas Richardson, an Ithaca based area musician. In the words of one of the participants, “It just made me open my heart – today changed my whole view of singing and writing poems”. Mulondo explained “when we first started, the participants didn’t say much, said they didn’t remember a lot about coming to the US as children. But in each session, as they started to share small bits, they each began to speak up more. Usually at the end of a session, they were talking, sharing and laughing more freely. Mark Cass, Director of the North Side Learning Center, explained that recent political developments have been tense but the Syracuse community has been supportive. The two nonprofits began planning this project over a year ago, well ahead of travel bans. Adapting to new customs and climates is daunting; families are most often admitted after long periods of displacement from situations they have fled. Cass explains that the girls involved in the project and families, while here legally, face these pressures and are worried for family that had hoped to join them. “The project has been wonderful for them, it’s been a great experience for them to be exposed to very talented and caring musicians and that this kind of technology, career ideas exist. We’re fortunate for this kind of unique program, and also for the time of volunteers like Brice Nordquist, Assistant Professor of Writing and Rhetoric of Syracuse University, who donated his time to work with the girls on their creative pieces”. This is the recording of the participants’ voices and message of peace: Assalamu alaikum which means "peace be on you". We hope to gain resources to do the project with additional young people. This project was made possible by the John Ben Snow Foundation and the JM McDonald Foundation. Music is a great force for healing – something we all need in our lives. We know many people in the US and abroad are shaken with uncertainty as 2016 draws to a close. We are more committed to ever to the importance of our work. That’s because it’s so powerful – able to build bridges between people, able to evoke memories and emotions, and as more and more research is showing, able to help people feel better. Continuing partnerships with the Berklee College of Music and aid centers in Uganda and Kenya. While we can attract small project grants for some of this work, they do not cover all costs. MWH relies on gifts from supporters like you to pair with these grants so we can pursue new partnerships with other nonprofits and keep our core operations running to be able to deliver these programs. As a friend of the organization, please consider a generous donation, continuing support of our programs that bring hope, soothing, and healing to so many people. Musicians for World Harmony works on an extremely limited budget, and your gift will be well used and deeply appreciated. Think of the last time you saw another’s eyes light up with joy, or recognition, or deep memory as a tune reaches their ears. We are fortunate in our work to see the restorative effects of music on so many peoples’ lives and souls. Thank you for your shared belief in that work and for considering this request! Just this month, I traveled with Doctor Bill Thomas to speak with doctors and therapists to urge them to include music and its therapeutic qualities in the daily lives of dementia patients. We spoke with doctors at the AgeWell Institute in Jacksonville and music therapists at TrustBridge in West Palm beach, and performed for seniors in Jacksonville, Orlando, Palm Springs and Tampa. When I returned from Florida, I was honored to perform for over 300 people in White Plains, NY, and work with seniors there. The positive impacts of music are evident to me in the participation of the seniors in centers in all of these places. Even when we played music that was not familiar to them, every single person was dancing or moving, and smiling. Seeing someone with dementia or who can barely move participate is a gift. On this trip, I was reminded of concerts I've given where people were dancing, shouting on summer nights. I realized that when a person in a wheelchair who starts out motionless, after a couple of songs, is just simply moving his shoulder in rhythm, he is connecting with the energy all around him in just the same way. That shoulder movement feels as loud and joyous as any concert I've played where people are jumping and singing. Historically, Musicians for World Harmony (MWH) was able to offer our MUSIC Heals Program to only the places that we could visit in person. We are finally back from Lira in northern Uganda where we had the most amazing experience working with victims of war. I have some exciting news. Our new CD, “Trust” is now available at more outlets. You can buy it from iTunes, cdbaby, Amazon and Best Buy with more outlets to come soon. All the proceeds from the sale, of this CD, go to support the work we do at MWH; to bring the healing power of music to the disadvantaged and the displaced in the world. It seems like every time I turn around lately I see something related to music therapy and the work we do. At my concerts I meet people that are music therapists, when I visit schools I meet students who are using music to work through difficult situations, and I have recently watched two special movies that remind me of the importance of the work that we do. Harmony, by definition, is the simultaneous union of various elements to produce a pleasing effect. In the lives of those affected by war, famine and poverty, addressing only medical and shelter issues proves not to be enough to achieve harmony. At MWH, our work continually seeks to address deeper issues of the human spirit so that a true harmony within individuals can be found.